I was bought skyrim in december 2012 as a present for the new xbox. If you get addicted on virtual reality type games then a warning – this is highly addictive and could completely ruin your partners weekends and holidays. The quality and speed and graphics are outstanding. I’d recommend at first not buying any addons and trying to complete the entire skyrim quests. I’ve spend a year on this game so far and got to the highest fighting level – and there are still quests and still skills that are there to be worked on. Leveling up (a part of every RPG) takes longer as you progress so its best to ensure your character is fairly rounded with health stamina and magic. The skills you get as you level up are much more up to you. Stones help with your leveling up. The lovers stone is very rounded (and since I tend to do everything at once the best for me). warrior stone helps with sword fighting and sich skills and so on. Leveling up is important because you will get new stuff you can do as you level up. 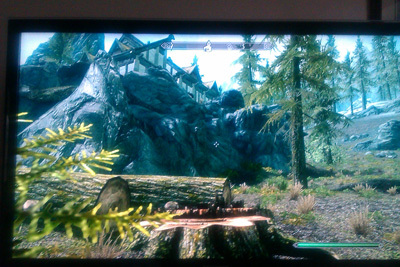 Why would you want to play Skyrim? Depends what kind of person you are. In the main you will find yourself maiming and killing – mostly skeletons (Draugr) and dragons once it gets going. There is the fabulous scenery which at times you may find yourself relaxing and just taking in the view. You can also cook, catch fish and talk to the various characters. There’s even a quest to be a kind of cupid. The celtic like art work of the houses and clothes are pleasant enough. You can get married (well worth it because she/he has a shop and pays you money), with certain add-ons adopt and have kids and create a home yourself. But in the main its a game about killing monsters. If your not into that don’t buy it.